According to a developing report from a local ABC News affiliate, thieves targeted two mall outlets in San Diego just before noon. Apple's store at the Westfield UTC mall was hit at around 11 a.m. Pacific, while a second incident was reported ten miles away at the Fashion Valley mall outlet just 30 minutes later. The San Diego Police Department noted suspect descriptions for both incidents match, suggesting the same cadre of thieves was involved in both robberies. Suspects were armed with knives when they entered Apple's store, but did not threaten store employees or customers, police said. It is possible that the weapons were used to cut through security cables Apple deploys on certain display items. The thieves made off with an unspecified amount of merchandise, concentrating on iPhones and Macs, police said. 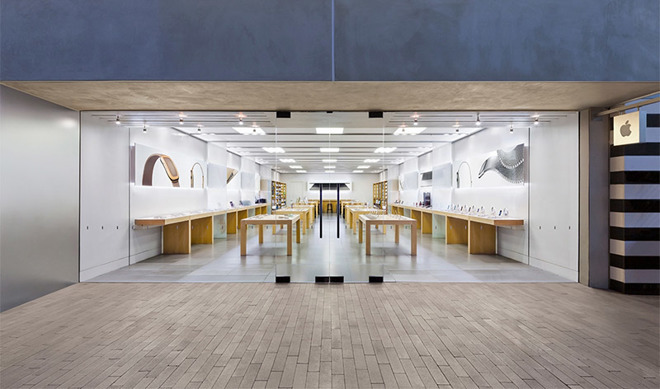 Apple stores are often a prime target for thieves, as each location lays out an array of expensive electronic devices on easily accessible display tables. Though most burglaries take place at night in smash-and-grab operations, some bold robbers flee with goods during business hours when stores are busy. Today's incidents are the second and third Apple store heists this week, coming two days after burglars stole $24,000 worth of goods from Apple's Corte Madera, Calif., location.